Sturdy working counter with a slat wall front. This unit can be used for so many different purposes. Great to put shelves or hooks in the front of this unit the create your time of sale purchase selection. Mix and match this unit with a register stand or corner unit to make a unique working / check out area. 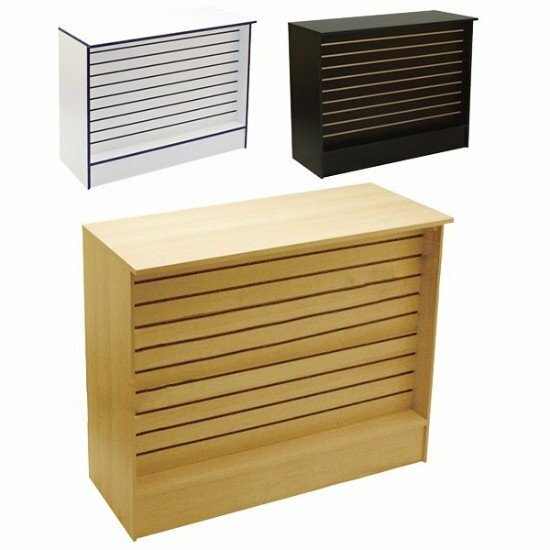 The Sales Counter with Slat all front comes in multiple different colors. Check out which one would work best in your store. Storage and shelving area in the rear.